www.sfpark.org is operated by the city of San Francisco. Sfpark.org's website and mobile app displays information about the prices and the availability of city owned garages (16) and the prices for meters that have "on demand" pricing at the time you view the website or app. the site estimates the cost parking for each garage and lists the 3 cheapest garage parking options within .25 miles for your destination. We filter our garages that are closed during the time you want to park. In addition, it will give you 3 closest garage parking option if you're more interested in parking close to your destination and don't worry about price. 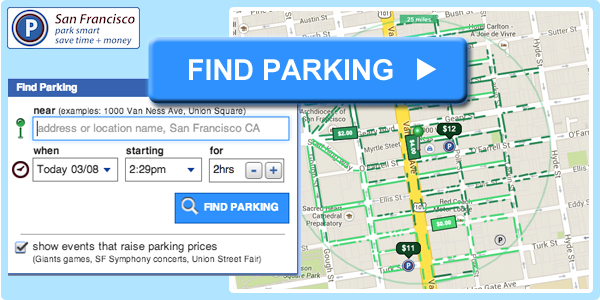 We show street parking options within a .25 mile walk from your destination and their prices. The prices are forecasted one week into the future so that you can see whether you want to take public transportation or take your car days in advance. The site includes 200+ privately operated garages in addition to the city owned garages. We display the locations and prices of meters with fixed prices in addition to meters with "on demand" pricing. You can see the additional meters www.parkinsf.com includes on this map. We show a rise in prices when there are ball park events and other events. These events can make finding cheap parking harder than usual. We show parking for valet and validated parking for a select number of San Francisco destinations such as restaurants and attractions. We show which meters that accept credit card payment vs. meters that do not. We show whether the meter is gray, yellow, green, or red. We account for street cleaning hours. We account for residential parking rules. We account for tow away hours. The table below summarizes the differences between ParkinSF.com and SFPark.org.